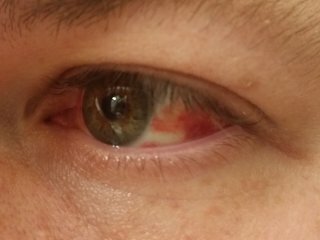 Among things that I never thought could happen, I never thought that throwing up could cause blood vessels in your eyes to break. 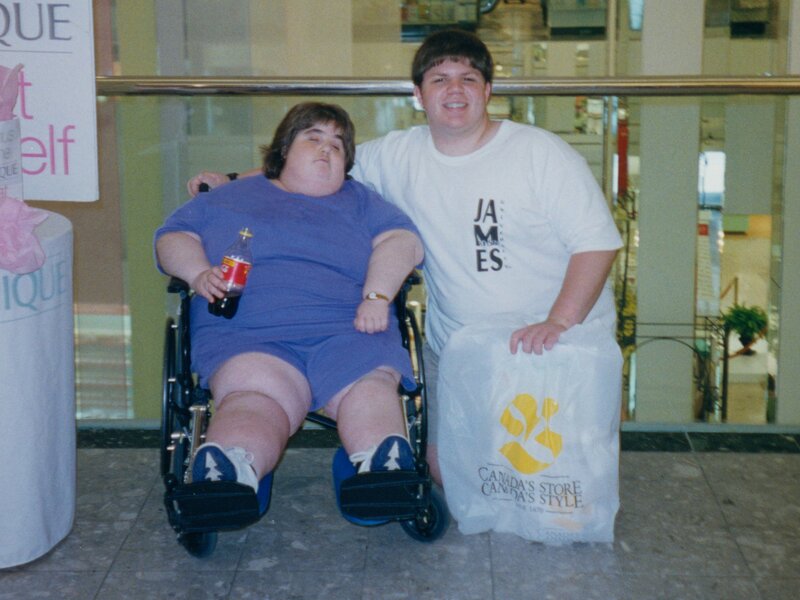 But take a look at this. I threw up on Friday morning. It’s kind of interesting how the blood kind of migrated overnight. 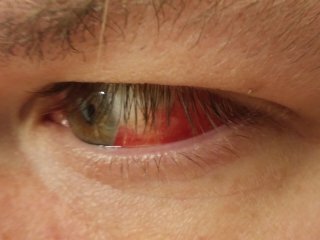 Of course, regardless, it meant that I now had to go into work with red eyes due to my brand new subconjunctival hemorrhages. But at least I had a good story to tell about why I was out sick on Friday. 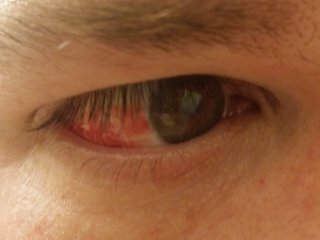 And who knew that the forces that come into play when it’s time to puke could blow out blood vessels in your eyes. I’ve heard of eyes watering and a massive headache before, but never have I seen blood vessels blow out like that. The good news, though, is that they’re harmless. They look really ugly, but they don’t affect your vision, and they resolve on their own with a little time. And meanwhile, the cause of my change in eye color was food poisoning. Twice. It’s like they say about being seasick. The only thing worse than being seasick once is being seasick twice. On Sunday, I had breakfast before I went in to work, which consisted of a sandwich and coffee. I started feeling bad early on in my day, and it got worse and worse and worse to the point where I had to call Central because I feared that I was about to throw up behind the wheel. Central sent a supervisor to take me back to the bus garage, and the supervisor brought another operator to take over the bus. I went home, and the nausea changed to a fever, and I had a pretty miserable night. then I took Monday as a sick day to recover. I also threw out what I believed to be the most likely culprits in my food poisoning adventure: a pack of lunch meat and a jar of salsa. I was feeling well enough by Monday night to where I could go about my Tuesday plans, which involved a trip to Philadelphia with Melissa and Elyse (Journal entry forthcoming on that). Wednesday, I had appointments, and then on Thursday, I was back to work. I had my coffee first thing on Thursday as per usual, and I started to feel funny after drinking about half the cup. Oh, no. Turns out that I threw the lunch meat and salsa out for nothing – it was something in my coffee! I would have never suspected something there, because the creamer was still within date, and I’d just about used it all up. It’s also never a good feeling to realize that you more or less just poisoned yourself. Work went well enough, though it was more tiring than usual, and then when I got home, I fell asleep very quickly, i.e. so quickly I didn’t even get my shoes off before passing out. The next morning, I had nausea again, and that’s when the puke happened. I’ll spare you the details, but let’s just sum it up as “gross”. I ended up taking Friday as a sick day to recover, because I was in no condition to go to work. 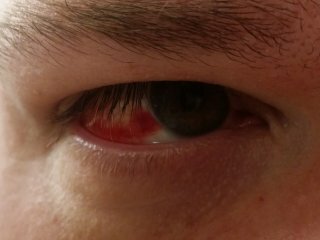 And then that night, I noticed that I had a subconjunctival hemorrhage. And until it clears up, I have to go about life with red eyes. I wondered how many people at work on Saturday would notice my subconjunctival hemorrhage, and as it turned out, if the passengers noticed it, no one said anything about it. I did, however, get some questions from coworkers about why my eyes were red. Nothing like explaining that one over lunch in the operators’ lounge. Meanwhile, the whole idea of dealing with suspect food after a food poisoning incident leaves me with mixed feelings on methodology. On one hand, part of me wants to clean the whole kitchen out and dump everything, i.e. more of a “scorched earth” idea. Then on the other hand, I paid for all of this stuff, and so I want to hone in on the culprit and only discard the most likely suspects. That’s what led me to the lunch meat and the salsa, which ended up not being the culprits. I only found out what the real culprit was when I got sick the second time. So now I’m going all scorched-earth on the coffee. The creamer’s already in the trash, and the coffee’s soon following suit. Then I’m also thinking that it’s probably time to retire my coffee maker, just to be on the safe side. That thing’s almost 13 years old, and honestly, I’m kind of afraid that it might be part of the problem, i.e. something might be growing in it, despite my best efforts to let it dry out between uses. Just as well. I wanted a new coffee maker anyway. So there you go, I suppose. I’m feeling much better now, and hopefully my eyes will be back to normal soon.